How to ensure permanent deletion of deleted files in Windows by destroying free space via command prompt: – When you delete files from your windows operating system, it seems that your files have been deleted from your hard disk memory and space is free for your usage. Yes, it is true that space is available for the usage but the reality is different. Even though you find that those files have been removed from your hard disk memory, but it remains there until it is overwritten by any other files. Several solid state devices deploy TRIM and Garbage collector which creates difficulty in the recovery of wiped data. Similarly, Windows has an inbuilt utility tool called Cipher. Cipher helps you to wipe off the free space from your Hard disk drive so that those files are permanently removed from your hard disk and cannot be recovered. Cipher works on the basis of three passes. On its very first pass, it fills the free space with zero data followed by its second pass which fills it with 0xFF numbers. In the final pass, it is filled with random numbers. Cipher works on three phases hence erasing of data using cipher tool takes a lot of time. You need to close all the applications while running cipher utility tools. 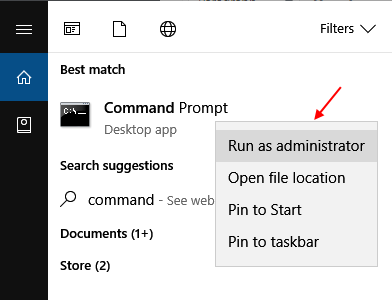 Right click on Command Prompt Icon and choose Run as administrator. 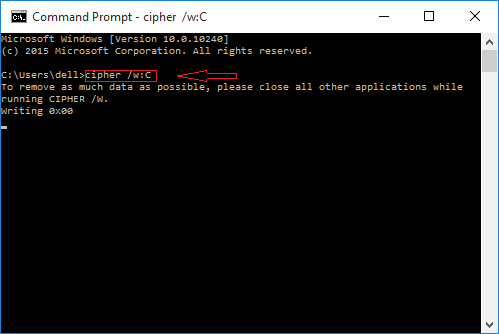 Step 3: Now type cipher /w:C command on your command prompt and press Enter. For example, if we permanently delete all the deleted files in the folder C then we will write cipher /w:C as a command in command prompt. But if you want to delete permanently files inside a particular folder only then write the folder name in place of folder_name. Since it is a three phase process, it will take some time. Instead of C , you can write the name of the drive which you want to clear out.